October 28, 1988. From the northeast 1/4 of Section 5, T34S, R17E to Coyote Bucket at the Fremont National Forest boundary. Scenic — 50.4 miles; Recreational — 8.6 miles; Total — 59.0 miles. The unique features of this southern Oregon stream are its distinctive scenery that varies from a steep canyon to broad meadows. The corridor contains a diversity of landform, rock form and vegetation. 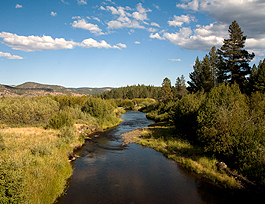 The vegetation is primarily coniferous with scattered old-growth ponderosa pine and lodgepole pine flats intermingled with water-related riparian vegetation, such as willows and other deciduous shrubs. Expanses of sage and bitterbrush in the dryer areas lend diversity. Of particular significance is Sycan Marsh which includes several rare plant communities and provides wetland habitat for Sandhill cranes, bald eagles and waterfowl.